Public schools are relying on technology for teaching, learning, and school operations like never before. Yet, with the embrace of technology, K-12 cybersecurity incidents are growing both more common and more significant. 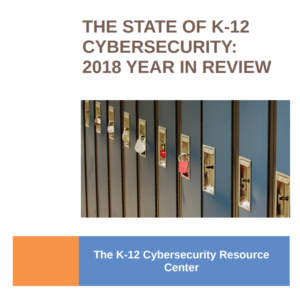 So concludes “The State of K-12 Cybersecurity: 2018 Year in Review,” a first-of-its-kind report focused solely on the misuse and abuse of educational technology in U.S. public schools and educational agencies. In addition to analyses of the 122 cybersecurity incidents experienced over the course of the calendar year – drawn from publicly-reported incidents on the K-12 Cyber Incident Map – the interactive report also offers new information on the demographic characteristics of affected school districts. 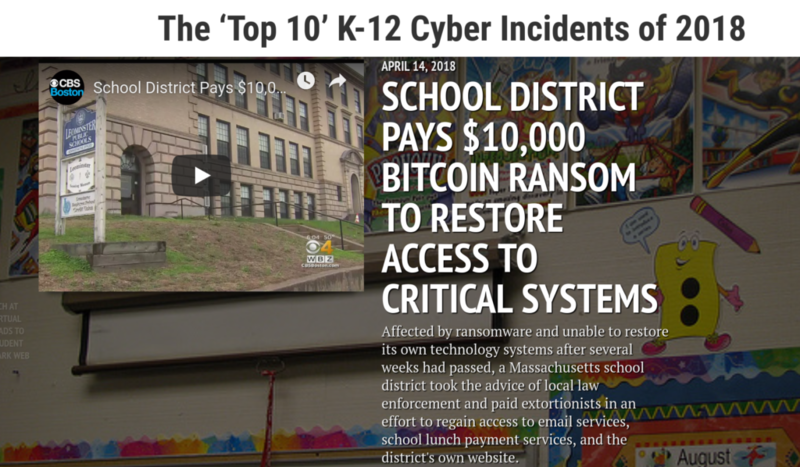 Further, the report includes a timeline of local TV news reports of the ‘Top 10’ cybersecurity incidents of 2018, which helps to portray both the variety and real-world impact of cyber incidents affecting public school students and educators. Ultimately – the report argues – the goal of policymakers, technologists, and school leaders must be to reduce and better manage the cybersecurity risks facing increasingly technologically-dependent schools. For news and updates about K-12-specific cybersecurity issues and incidents – as well as to be notified of new resources such as this report – be sure to sign up for the newsletter of the K-12 Cybersecurity Resource Center and follow @K12CyberMap.